Kirstjen Nielsen has resigned as secretary of the Department of Homeland Security (DHS). President Trump has named Kevin McAlneenan, the commissioner of U.S. Customs and Border Protection, as acting secretary. The border situation has gone from bad to worse during her tenure, especially in the past few months, when an unprecedented surge of migrants and “asylum seekers” have overwhelmed the Border Patrol and ICE. As a consequence, thousands of illegals have had to be released into the U.S., with only a promise to show up for scheduled court dates. It is assumed that many or most will simply disappear. 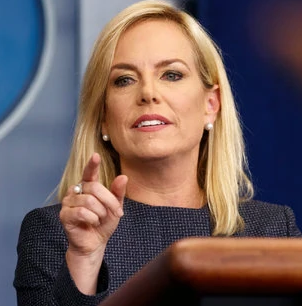 President Trump had reportedly become increasingly unhappy with Nielsen’s performance lately and had expressed interest in taking a more hard-line approach. A further indication of that change of heart was his unexpected withdrawal last week of the nomination of Ronald Vitiello to head ICE. For more on the Nielsen resignation and possible aftermath, see the Business Insider.